For my folding bicycle I needed a new saddle, preferably something light because I lift that bicycle up all the time, and comfortable, affordable and cool looking, because you always want that with anything you buy. 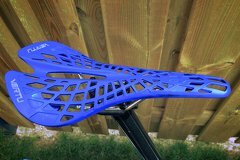 I don't know where I first saw it, but somehow I came across a cool looking bicycle saddle on AliExpress called a Spyder seat. One day, it was a good price and I bought it, and then kept it for several months before I installed it on my folding bicycle, for which I also got a new (longer) carbon seatpost. The Vertu Spyder saddle is very cheap. You can find it online at sites like AliExpress, Amazon and Ebay for less than 10 euros. Some bicycle shops also sell it, sometimes for as much as 25 euros, for what seems to be the same thing. It comes in many different colors, I got the blue one. 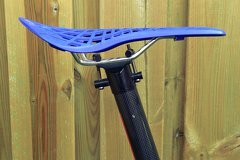 The Vertu Spyder is a knockoff from Tioga Spyder Twintail saddle, which costs around 90 euros and is a much more expensive saddle. 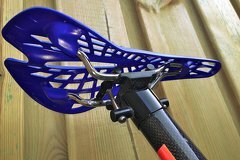 The idea behind it is that you have a very light weight saddle made out of a webbed structure that instead of providing comfort through padding it is more like a hammock. This idea is similar to leather seats and also the Brooks Cambium saddles. So it's light weight, comfortable with great ventilation. What is the catch? 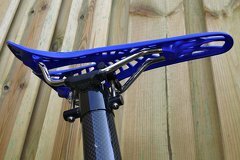 Although Tioga claims it is made out of a fancy sounding, yet vague "Carbonite Composite" material, they also recommend to replace the saddle every year. It seems like durability is a serious problem. It is also weird, because a heavy rider who rides a lot would wear it out much faster than a light rider who does not ride as often. Since you buy a knock off for less than 10% of the price, it only has to last six weeks to get your money's worth. Although the Vertu Spyder has a similar name and iconic design as the original it is not a counterfeit. It is sold under a different brand name and has some different features. The most obvious difference for me were the rails. They are very shiny and don't have any markings on them. They seem a bit out of place with the rest of the saddle. 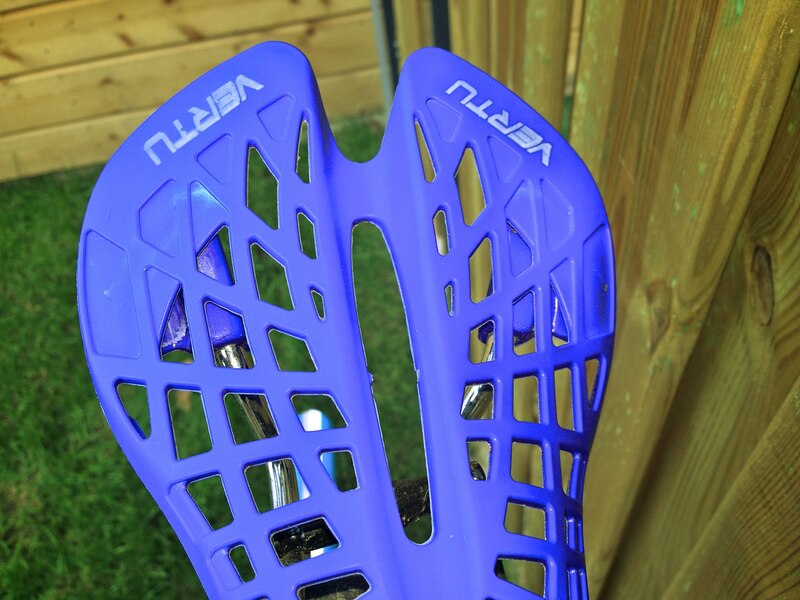 The plastic of the saddle also lacks any text. There were some small stickers on there (similar the original) but the adhesive was so bad that they fell off before I even put the saddle on the bicycle. 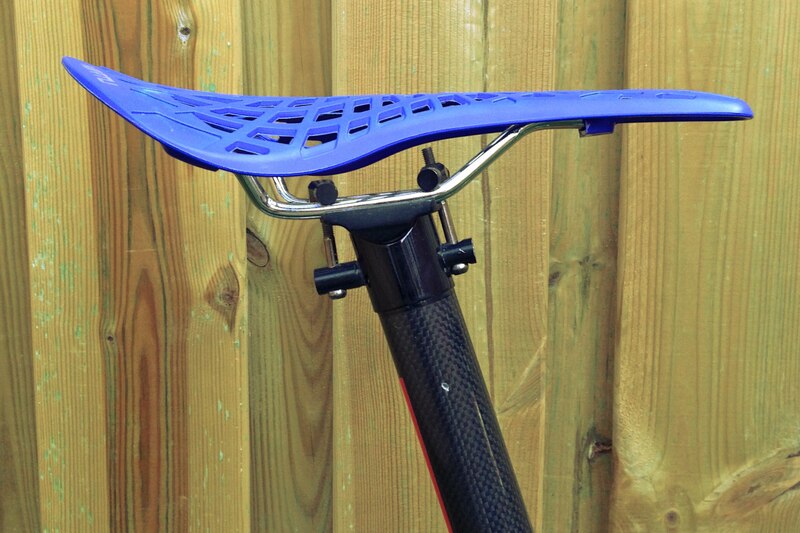 The saddle is like any other, the two rails fit on the seatpost. Unlike most saddles there are no markings to indicate how far you can slide back and forth. This saddle has an interesting look to it. The shiny rails would have looked better with a darker or matte finish in my opinion. From the side it is quite a sleek saddle. Again, the rails attract a lot attention. Close up from the rear, the light marks are from pressure on the plastic. The saddle feels quite comfortable when sitting on it, the hammocking effect seems stronger than that of the Brooks C17. The holes not only make it lighter, they also provide ventilation. Some reports have say that it damages their pants, but the Brooks C17 does this too, but worse. One downside is that in wet conditions water would not just spray up on my back, but also under the saddle. This problem was mostly solved by adding a rear mudguard. After commuting on it for four ten months with about 10 kilometers per day I am still quite happy with the saddle. There is some slight discoloration on specific parts in the back which could be a sign of wear, but for now the saddle is still holding up. 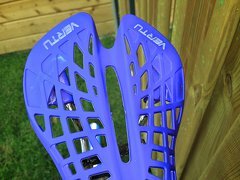 So far I am very satisfied with this saddle, I would buy the same one again if it were to break, even if it was wearing out after a few months.